Blood Moon is a phenomenon in which we have a total lunar eclipse, meaning that the Sun, the Earth and the Moon are aligned and the Moon enters the shadow of the Earth, called the Umbra. Blood Moon: why is it called so? During a total lunar eclipse the Moon changes colour, unlike the Blue Moon, where this doesn’t happen. 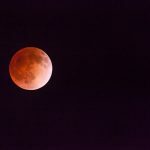 As sads, when a total lunar eclipse happens and the Moon enters the Umbra, it will make it get a reddish colour and therefore it is commonly called the Blood Moon. This happens exactly because the shadow of the Earth, the Umbra, is projected onto the Moon. The Blood Moon is a phenomenon where we experience a moment of union between the Goddess and God. It is a moment of great power and magic that must be experienced with enthusiasm. During a Blood Moon you can cast a spell to attract prosperity, so that energy flows like the blood that keeps us alive. During the night of the Blood Moon, trace the magic circle and stay in its centre in a comfortable place. Put the 4 red candles so that they represent the 4 directions and the 4 elements. Light your favourite incense if you wish. Fill your chalice with wine and dedicate it to the Goddess. Concentrate on the Blood Moon and let your mind connect with the energy of the moment. Visualize the blood running through your body as you watch the Blood Moon. Feel the heat. Feel the life that runs within you. Stay in this state for the entire passage of the Moon through the Umbra. You can also close your eyes as you feel the power within you. Drink the wine or the juice and thank the Goddess and God. Let the candles burn to the end if they are still on and, finally, unlock the circle.